Our survey for the French elections is now officially complete. We would first and foremost like to thank everyone who participated and made our prediction possible. We analyzed the first round results in our previous post this week, and concluded that although this election seems like a landslide victory for Macron, things won’t go down that easy. The polls consistently gave him a 20 point lead in front of Le Pen, an advantage that was slightly narrowing before the debate on May 3rd, but after the debate and what was apparently a resounding victory for Macron, his chances went up again. The final results of our prediction survey suggest a slightly tighter outcome than what the polls are currently suggesting. As shown in the figure below, we have Macron at 55.9%, and Le Pen at 44.1%. Our survey was at all times a bit more conservative and has, unlike all the other polls, consistently estimated a narrower gap between the candidates. There is a regional variation as well. We predict Macron to take all of the Western and central regions as well as Paris (Ile-de-France) and the Auvergne-Rhône-Alpes region. 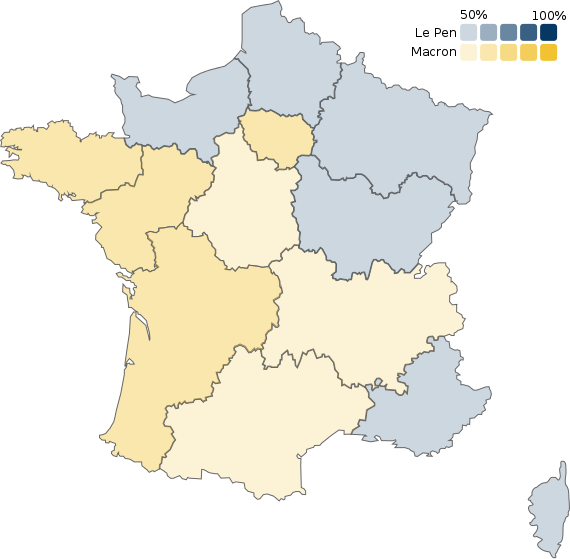 Le Pen will most likely win in Provence-Alpes-Côte d\’Azur and in Corse, and will probably come on top in the North-West. However, just like the polls, our survey has never brought Macron’s victory into question. The issue was only the margin of victory and how precise our prediction will be compared to the average of the polls. The blue and yellow zones around the lines show the average errors for each candidate’s predicted vote share. At this point the errors are around 4 percentage points in each direction. This suggest that the overall likelihood of a Le Pen victory is below 1%. Unless there is a huge Black Swan event on Sunday, Emmanuel Macron should be the next President of France.